Earlier this year I commended Canada’s TJ Grant for doing the right thing by stepping away from a scheduled UFC title shot due to a concussive injury sustained during practice. Brain health should not be taken lightly and his choice, as difficult as it must have been, was worth positively highlighting. Few mixed martial artists rise to the top of the food chain and there are no guaranteed second chances and even fewer third chances in the UFC title landscape. 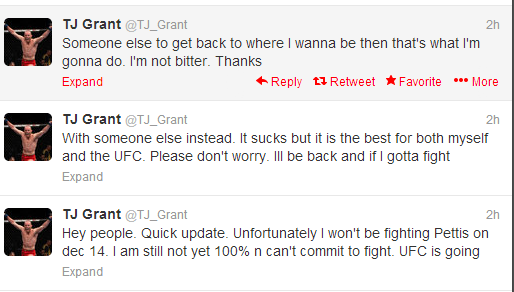 Stepping aside means a title shot is no longer guaranteed for Grant if and when he is healthy enough to return. This is a tremendous sacrifice for a professional combatant where fame and fortune are only reached at the very pinnacle of the sport. In addition to Grant’s leadership, Joe Rogan voiced the below comments in a recent episode of his popular podcast warning aspiring combatants not to take the consequences of head trauma lightly. “There could be any point in time a tipping point. and head trauma is just no joke, and any unnecessary head trauma that you want to introduce in your life, I think is a terrible idea….I don’t even kick box spar…because its not worth it. Listen to me man, you only can get hit a certain amount of times in your head. I know a dude who lost his sense of smell, he took a beating and lost his sense of smell, and it was just a one, two head kick combination…Head trauma’s not to be fu**ed with…I’ve seen people take some serious punishment and change them as a human being, change the reality of their life, impair their function, its real...I’m not saying that anybody should not do MMA,I think if you’re going to take risks its ridiculous to take risks that have within them the possibility of massive trauma and not do it correctly…I’ve never discouraged someone who wants to actually be a mixed martial artist…I just always say if you’re going to do it remove as many variables as possible “. Competing while recovering from a lingering concussion is an easily removable variable. These are wise words from Rogan, a vocal fan of the sport, who arguably has watched more elite live MMA bouts than anyone else. The above actions and comments from senior figureheads of the sport do well to serve the public that head trauma is no trifling matter. A positive shout out to both Grant and Rogan for demonstrating concussive leadership in combat sports. Well said, Erik! Thanks for addressing this important topic. I like Rogan’s approach: “I just always say if you’re going to do it remove as many variables as possible “. That’s eminently practical and realistic while placing the emphasis on safety. Keep up the fine blogging here!